U.S. Men's Soccer Is On A Roll — All The Way To Rio? : The Two-Way The Americans put on a show at the Gold Cup tournament, outscoring opponents 20 goals to 4 and stretching the team's win streak to 11 games. Even if that doesn't exactly send a chill through the rest of the world soccer community, it's enough to gives U.S. fans real hope for the 2014 World Cup in Brazil. At the beginning of 2013 — with only a year before soccer's crown jewel event, the World Cup in Brazil — all was not rosy with the U.S. Men's National Soccer Team. There was that 0-0 tie with Canada, and then a 2-1 loss to Honduras in a World Cup qualifier. But now, the cry is, "Break up the Americans!" 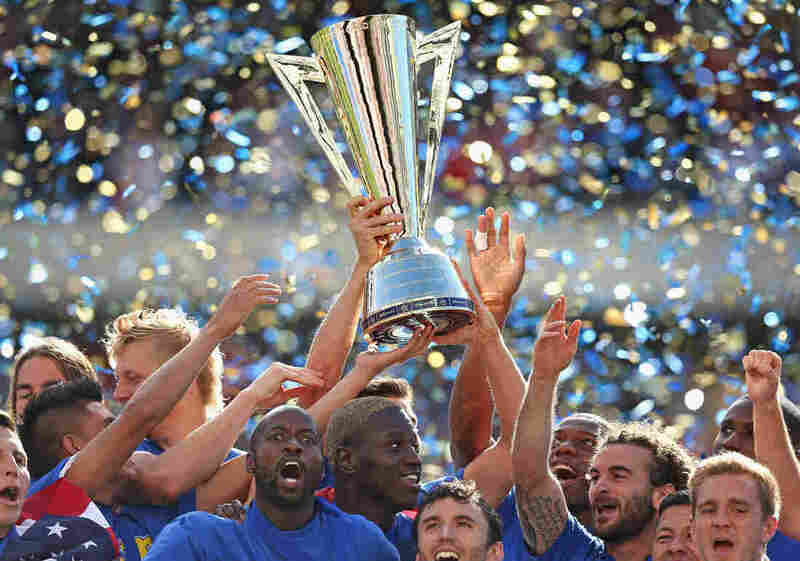 OK, that's a bit of an overreaction to Sunday's CONCACAF Gold Cup victory. The United States' 1-0 win over Panama in the championship game isn't exactly sending a chill through the rest of the world soccer community. The Gold Cup is something the U.S. should win, having done so four times now since 2002. Still, there's plenty to feel good about after the team's undefeated run through the North and Central American regional tournament. The U.S. outscored opponents 20 goals to 4, led by Chris Wondolowski and veteran Landon Donovan, who had five goals each. The six victories stretched the American winning streak to a record 11 games. And the Gold Cup revealed how deep the team is: The U.S. essentially fielded a B team, prompting fans to dream about what the men could do at full strength. Perhaps the most exciting part of the Gold Cup was the return, in bold, of Donovan. His inspired play after a self-imposed sabbatical from the game motivated his younger teammates and appeared to smooth over a fraying relationship with head coach Jurgen Klinsmann. The coach wasn't exactly overjoyed when Donovan — who SoccerAmerica.com executive editor Mike Woitalla calls the greatest player ever for the U.S. — took a months-long break on the eve of World Cup qualifying games. Klinsmann made it clear that the all-time leader among U.S. men in scoring and assists would have to earn his way back onto the national team. "Because of what he has achieved in the past, his benchmark is higher than all of the others," Klinsmann said. "We had honest conversations about it, and I said, 'I want the best Landon ever.'" Donovan met expectations and then some. Now it seems he'll once again be an integral part of the U.S. men's effort to take on the world next year in Brazil. World Cup success has been an elusive goal for the U.S. men, aside from that semifinal finish in 1930 — the Americans' best-ever showing. Since then, there's been the occasional shock of upsets — a 1-0 win over England in 1950 and a 2-1 win over world No. 4 Colombia in 1994. But mostly, it's been first- and second-round exits. Woitalla says the men have been on a plateau for almost two decades, never reaching the level of consistent, successful World Cup performers such as Brazil, Spain, Germany, Italy and France. He thinks it's because of the kinds of players suiting up for team USA. "We have more good players than we've ever had," Woitalla says, "but the number of truly exceptional players — the ones who can do the unpredictable things on the field, the wonderful, creative moves and playmaking — the number of those [players] really hasn't increased." The 2014 World Cup, for which Woitalla says the U.S. is certain to qualify, will feature two Americans with those exceptional qualities: Donovan and Clint Dempsey. But he believes the U.S. should have had 10 Donovans and Dempseys by now. Youth soccer is expensive and thus out of reach for kids who may have the talent but not the resources. Over-coaching: Kids aren't being allowed to experiment and take risks and make mistakes. You have to make mistakes, Woitalla says, while you're becoming a player who can improvise and do brilliant things with the feet. Woitalla thinks there's been progress. He says a growing Hispanic community, passionate about soccer, is getting more opportunities to enter the mainstream of the sport. And at the elite level, he thinks coach Klinsmann is the kind of charismatic leader who can take the current crop of top players and mold them into something special. The Gold Cup victory is an early indicator. A significant run in Brazil next June would be the proof.